As you can see, I am still using up some of those ramps. I literally went on a ramp cooking frenzy – trying to work the flavor of the ramps in to anything possible. You see, ramp season is only around for a short time. You need to take advantage of the Spring season for these wild leeks as much as possible. I recently picked up some amazing salmon. I had a bit over a pound of salmon, and it being so perfect and so fresh, I knew I had to cook it just right. I made up a mixture of garlic, lemon juice, salt, pepper, honey and chopped ramps. I rubbed the mixture on the salmon and placed it in the oven. It was that simple! The simple seasoning, along with the fabulous chopped ramps, gave this dish a wonderful flavor. 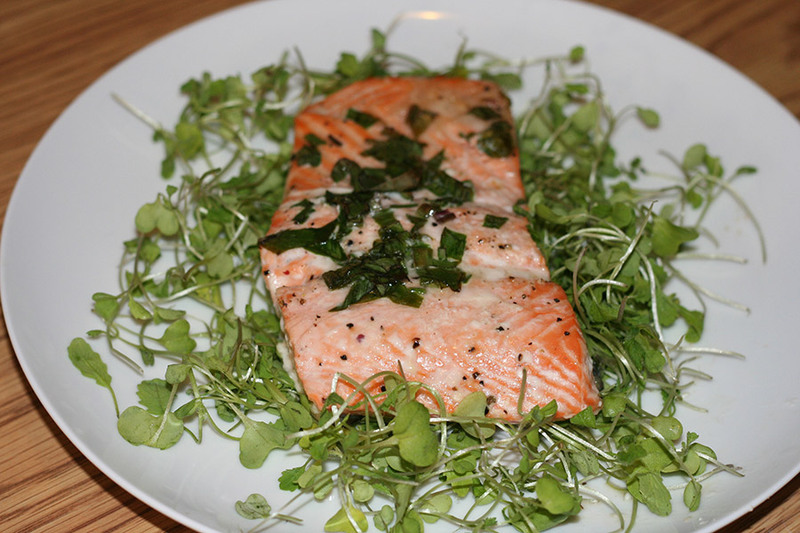 To round it all out, I served the salmon over a bed of wasabi microgreens. This was an amazing dinner. 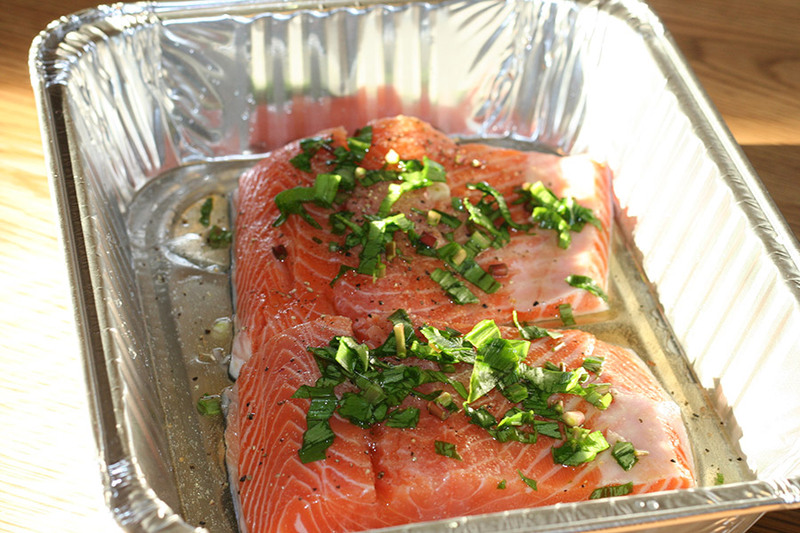 Bake the salmon at 375 for about 13 minutes - check on the salmon. You don't want to overcook it. Our fridge died this past week. It happened to give its final burst of cold air on a 90+ degree day. My kind of luck, right? So with that fridge, out went lots of food. Somehow, the fridge and food mess happened at the right time. Things like these rarely do. It just worked out that we were able to find and buy a new fridge pretty quickly, thanks to the fine people at the Sears outlet. Just six or so hours after the fridge was delivered, I also had a brand new Fresh Direct order delivered to my door. It’s those little big things that happen, that can make your week look a little less bleak. This was the first time I ordered through Fresh Direct, the fabulous online grocery delivery service. I am thrilled they have begun to deliver to my neighborhood. I was very impressed with their selection and prices. So it happened, that I found myself looking at the most beautiful bunch of fresh and local ramps. Have you tried ramps? Ramps are a variety of wild leeks. They have a short season – usually found in my area in the Spring time. They are wildly popular. It seems that as soon as you see them at the farmer’s market, you must grab them fast, or they will be gone before you know it. So this season, every time I have seen them, I have been sure to grab them so that I don’t miss out. I really love the way ramps look when cooked whole. I find them both pretty and tasty. Their dark green leaves add so much to the look of a dish. They taste fantastic too! For a recent Shabbat dinner, I chose to wrap some chicken drumsticks in the ramps and glaze them with a sauce, then roast them in the oven. I loved the way these looked, both raw and cooked. They tasted even better. I began my liberally sprinkling the chicken with salt and fresh ground pepper. I trimmed and washed the ramps and then wrapped them whole around each drumstick. I then brushed each chicken leg with the sauce I prepared and poured the rest of the glaze over the chicken. I then baked the chicken at 375 for about an hour. Everyone enjoyed this chicken. It was served up with some fresh roasted asparagus and roasted sunchokes. You really can’t go wrong with this chicken dish. Enjoy! Wash and dry your chicken pieces. Wrap each piece of chicken in a ramp and place in baking dish. In a small bowl, mix up the maple syrups, Dijon mustard, olive oil, garlic, and ginger. Brush the glaze mixture on to chicken. Pour any remaining mixture over the chicken. Sprinkle additional salt and pepper oven the chicken. Bake in the oven at 375 for about an hour. Check the chicken for doneness.